“With the advent of WiFi-connected “smart” devices, IR remotes are quickly becoming a thing of the past. Why sort through a coffee table-full of remotes when you probably have a much smarter, WiFi-connected device device sitting conveniently in your hand? The WiFi IR Blaster is designed to connect all of those old, legacy IR-controlled devices to a WiFi network – exposing them to a new method of control. Want to control your TV via a web-browser? Want to ask Alexa to mute your stereo? Want to schedule triggers to your IR-controlled LED strip? These are all applications that the WiFi IR Blaster is perfect for. 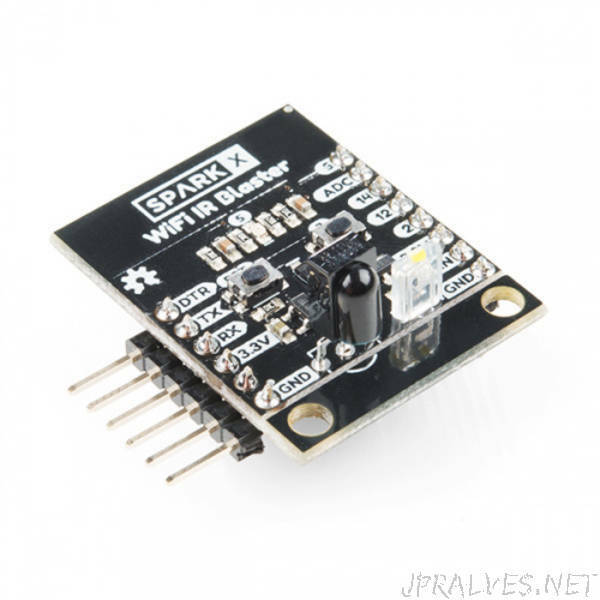 The WiFi IR Blaster combines an ESP8266 – a powerful WiFi/microcontroller SoC – with IR emitters and receivers. With built-in WiFi support, the ESP8266 can be programmed to provide an interface between HTTP, MQTT, TCP, etc. and infrared-controlled devices.